Condominium Beach Class Resort-beach of Muro Alto, in Porto De Galinhas. A house by the sea: differs from the flat- it is not flat. It is on the best stretch of beach, warm and calm waters, with all the infrastructure of one of the best condominiums in Porto de Galinhas, this is Bungalow 7216 in Beach Class Resort. Downstairs we have 1 bedroom with 2 twin beds (single), bathroom with boiler, hair dryer, full American kitchen with electric cooktop, electric oven, microwave, duplex refrigerator, crockery and pots, dishwasher, sofa-sized double bed and SKY TV, balcony to the garden with 4 seater table and hammock. In the 1st floor bedroom with king size bed, en-suite bathroom. hair dryer, shower with boiler. The balcony has direct access to the garden overlooking the sea and pool, less than 10 meters from the beach with natural pools. All air-conditioned environments. . Fantastic pool, wet bar, jacuzzi, games room, kids area, playground for kids, gym and sauna. It also has a restaurant with pool, cafe, lunch and dinner service. Wifi. Tennis and football court. Ideal place for family leisure, group of friends and couple, with privacy, security and proximity to the activities of the hotel. 15 minutes from the village of Porto, with shops, restaurants, diving in the natural pools and visit the reserve of Cavalo Marinho. The beach of Maracaípe is 8 km, destination is part of the national and international surf circuit. Lessons on site. From Porto you can take tours to the historic city of Olinda and beautiful Carneiros Beach, both about 50 km away. Muito bom realmente superou minha expectativa eu e minha família passamos ótimos dias no local. Recomendo para quem quiser ir o bangalô da Sra. Helena em beach class praia de muro alto, bem localizado a proprietária nos deu toda atenção possível e bem confortável o imóvel, já estamos com saudades!! Muito bom o bangalô, limpo, ótimas camas e lugar espetacular. Simplesmente fantástico!!! Fui com 2 idosas e 2 crianças e o imóvel atendeu perfeitamente. Tudo conforme descrição. ficamos apaixonados e recomendamos aos amigos...espero voltar em Breve. A Helena foi de uma atenção impar antes, durante e depois da nossa estadia. Recomendo demais!!! o Bangalo era muito melhor do que imaginávamos .. lugar tranquilo,familiar, limpo, aconchegante, ar condicionado em todos os ambientes...tudo perfeito. Mobiliários e utilidades domésticas impecáveis . Roupas de cama e banho limpas e cheirosas. Fizemos excelente estadia !!! No bangalô havia tudo que precisamos.... uma vista para piscinas fantásticas e com Águas quentes!!! 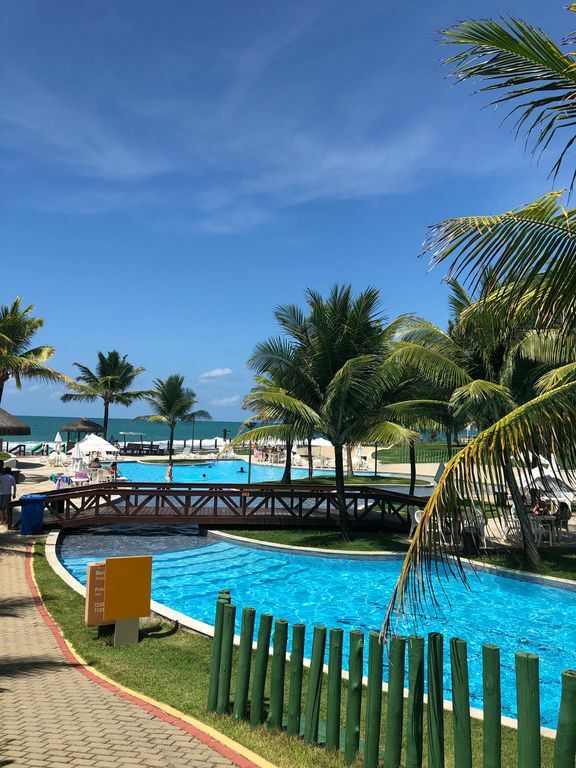 O resort muito limpo, organizado e bem cuidado!! There are 800 feet of hotel, natural pool with stand up and kayak rentals. Raft and buggy ride to nearby beaches. Ha uma taxa de 100 reais da faxina. Caso tenha interesse em usar o nosso enxoval, favor comunicar. Ha uma taxa de 95 reais da lavanderia. Unidade nao fumante, nao permitido animais.